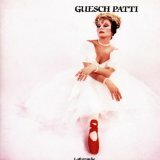 Guesch Patti, (16 March 1946), born Patricia Porasse, is a French singer. Patti was born in Paris, France. She chose her artist name from the nickname she had as a child Guesch. Patti is a nickname for Patricia. Guesch Patti first started her career at dancing at age 9 when she performed in a ballet at the Opéra National de Paris, working with Roland Petit, then at contemporary dance with Carolyn Carlson and Pina Bausch, and finally at variety dance on television.